The C10 reduces the cost and complexity of installation and maintenance. 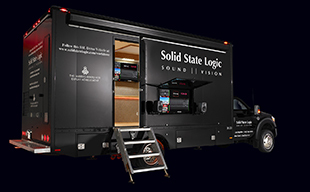 The console control surface is convection cooled and compact making it ideally suited to studio and OB vehicle installation. Console frame sizes are available from 8+8 to 32+8 faders with Processing & I/O scaled accordingly. The Blackrock Processor unit is built into the console frame. I/O and Router options are also compact and rack based and can be located remotely from the console. A simple ‘console network’ uses redundant Ethernet data/control interconnection between consoles in a multi console system. Standard Optical MADI (AES10) digital audio cabling is used to connect the console to the I/O. MADI audio connectivity provides easy, lossless integration and distribution of bulk IO, with support for very long cable runs, reducing both the cost and time involved in cabling. SSL C100 and C10 Digital Broadcast Consoles can connect and integrate with installed Dante based IP Audio Networks and systems from Riedel and Optocore providing flexibility and choice for system designers. 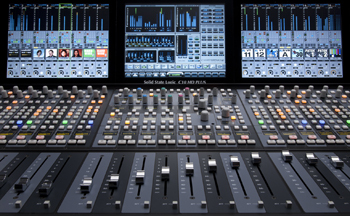 With the introduction of SSL's Network I/O range of audio interfaces C100 and C10 consoles can now be interfaced with IP Audio Networks using Audinate's Dante technology. Using the Network I/O range SSL digital broadcast consoles can be elegantly interfaced with devices from more than 75 different manufacturers using a Dante IP Audio Network. The SSL Network I/O range consists of 'MADI-Bridge,' providing 64 bidirectional channels of fully redundant MADI-to-network bridging with front panel confidence headphone monitoring; 'SDI,' bridging eight 3G-SDI embedders and eight de-embedders to the network or MADI with internal per channel routing; and 'Stagebox,' which provides eight channels of mic/line I/O (using SSL's renowned SuperAnalogueT mic pres) with redundant network connectivity. With Dante committed to conform with AVB standards and with AES67, the SSL Network I/O range is ready for future networked audio developments. C100 and C10 digital broadcast consoles can connect to Riedel RockNet low latency audio distribution network and MediorNet fibre-optic transport, routing and conversion network. Via Riedel's RN334.MD MADI interface, SSL consoles can then remotely control mic Gain, Phantom Power and Pad settings for Riedel RN series audio interfaces connected anywhere on a RockNet network. 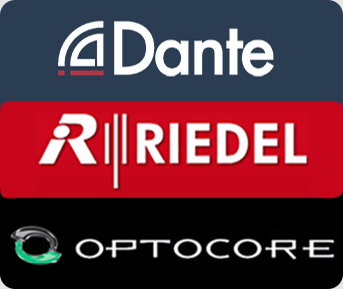 In addition SSL's own MORSE Stagebox and Alpha-Link I/O units can also be connected via MADI to Riedel's MediorNet networks with full remote control capability maintained for SSL consoles. Redundancy is a key feature for both SSL and Riedel customers and the implementation ensures that Riedel and SSL remote I/O continue to behave as expected within SSL's redundancy topology. With the SSL MADI I/O control protocol integrated into Optocore's topology, SSL C100 and C10 consoles can transmit/receive up to 128 audio I/O channels over an Optocore Optical Digital Network System. In addition users have the ability to remotely control the microphone preamplifiers in the 48 input Optocore LX4AP stagebox. Under the implementation SSL C100 HDS and C10 HD consoles will automatically identify, label and control any connected Optocore LX4AP Stageboxes. Combining SSL's MORSE Stageboxes with Optocore LX4AP Stageboxes allows users to connect multiple consoles and stageboxes with full redundancy. The ability to remotely control stagebox gains over the Optocore fibre network is a major advantage for users, giving that extra degree of flexibility and control over the relevant parts of an installed system.